Gandhi Smriti Museum, New Delhi is located on Tees January Marg nearby Gandhi Samadhi at Raj Ghat, in New Delhi. it contains personal relics, documents, photographic, manuscripts, books, journals and audio-visual materials related to Gandhiji. The museum comprises a khadi and village industry products shop to commemorate this aspect of bapuji. The film industries in India and abroad have made many films on Gandhiji. Such films are shown daily at the museum. Buy some khadi products available in these shops at a reasonable price. If you are a Gandhi fan then do visit the Gandhi Smriti Museum in New Delhi. 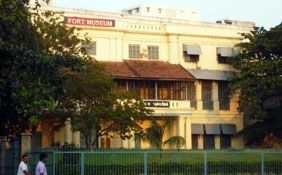 Gandhi Smriti Museum, New Delhi is located on Tees January Marg nearby Gandhi Samadhi at Raj Ghat, in New Delhi. This national memorial helps the travelers to know more about the life and contributions of the father of the nation. Among the best tourist attractions in New Delhi, Gandhi Smriti Museum is one tourist draw you can not miss. As you visit this museum you can get a detailed knowledge of the personal relics, documents, photographs, manuscripts, books, journals and audio-visual materials related to Gandhiji. Get an insight into the life and work of Mahatma Gandhi as you explore the various sections of the museum. This is the best opportunity to gather information on the greatest freedom fighter of the nation. Besides, Gandhi Smriti Museum, New Delhi holds regular exhibition of dolls that depict significant landmarks in Gandhiji's life. Gandhiji had popularized the use of Khadi and other village products. The museum comprises a khadi and village industry products shop to commemorate this aspect of bapuji. You can even buy some khadi products available in these shops at a reasonable price. The film industries in India and abroad have made many films on Gandhiji. Such films are shown daily at the museum. The museum remains open on all days from 10:00 to 17:00 hrs, except Mondays and national holidays.